Thepast decade has been one of the most volatile periods in global petroleum markets in living memory, and future oil supply security and price levels remain highly uncertain. This poses many questions for the professional activities of planners and urbanists because contemporary cities are highly dependent on petroleum as a transport fuel. How will oil dependent cities respond, and adapt to, the changing pattern of petroleum supplies? What key strategies should planners and policy makers implement in petroleum vulnerable cities to address the challenges of moving beyond oil? How might a shift away from petroleum provide opportunities to improve or remake cities for the economic, social and environmental imperatives of twenty-first-century sustainability? Such questions are the focus of contributors to this book with perspectives ranging across the planning challenge: overarching petroleum futures, governance, transition and climate change questions, the role of various urban transport nodes and household responses, ways of measuring oil vulnerability, and the effects on telecommunications, ports and other urban infrastructure. 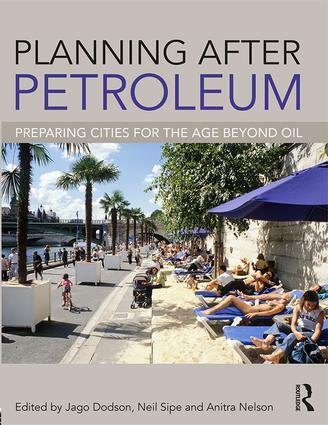 This comprehensive volume – with contributions from and focusing on cities in Australia, the UK, the US, France, Germany, the Netherlands and South Korea – provides key insights to enable cities to plan for the age beyond petroleum. "When future generations look back on today’s struggle to move off oil as the lifeblood of global society, they will wonder why it took so long for people to see the writing on the wall and find a better way to power the engines of human endeavor. This volume makes an important contribution to that writing on the wall and presents promising tools needed to deal with our energy problems. If contemporary economic and political leaders can learn from the thoughtful approaches in this book, the inevitable post-carbon future that awaits will bring a brighter day for human civilization." 9. Children’s Active Transport: An Upside of Oil Vulnerability? Jago Dodson is Professor of Urban Policy and Director of the Centre for Urban Research, RMIT University (Melbourne, Australia). His work has addressed theoretical and applied problems in housing, transport, urban planning, infrastructure, energy and urban governance. He has advised governments on urban policy and is active in scholarly and public debates about Australian cities. Neil Sipe is Professor of Planning in the School of Geography, Planning and Environmental Management at the University of Queensland (Brisbane, Australia). His research interests include transport and land-use planning, natural resource management and international comparisons of planning systems. Anitra Nelson is Associate Professor at the Centre for Urban Research, RMIT University (Melbourne, Australia). She edited Steering Sustainability in an Urbanizing World: Policy, Practice and Performance (2007), co-edited Sustainability Citizenship in Cities: Theory and Practice (2016, Earthscan/Routledge) and is writing Small is Necessary: Shared Living on a Shared Planet (2017).